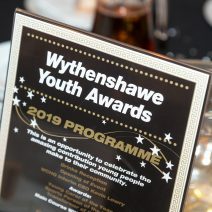 The Wythenshawe Youth Awards took place at the Woodhouse Park Lifestyle Centre on the 14th March 2019 and were an opportunity to celebrate the young leaders of tomorrow. These awards are held annually to celebrate the outstanding achievements and contribution young people make to their local community. This year’s event was co-hosted by Executive Director of Housing Jacque Allen and Assistant Manager for the WCHG youth team Joe Amos on behalf of Wythenshawe’s Children’s & Young People’s Alliance. Over 80 young people attended the event which included some very special guests, The Lord Mayor of Manchester Cllr June Hitchen and The Bishop of Manchester, Dr David Walker. Lord Mayor of Manchester Councillor June Hitchen said: "Youngsters in Wythenshawe make a remarkable contribution to their community. The Wythenshawe Youth Awards provide the chance to honour their achievements and recognise all of the fantastic things they do, in a well deserved celebration of the positive differences they make for the wider community. The Bishop of Manchester, Doctor David Walker said, “These amazing award winners are the living proof that our young people in Wythenshawe can show all of us the way to be good citizens and valuable members of our local community. The awards were sponsored by WCHG, Real Lives Wythenshawe, City in the Community, Manchester City Council & The MU Foundation.